June 22….Buddy Holly Summer Showcase Series - This week Mariachi Mexico Lindo plays Traditional Mariachi. Summer Showcase 2017 is free to the public. There will be a cash bar, food and beverages available for purchase. Please, no outside beverages are allowed. Performances are every Thursday evening from 5:30 pm – 7:30 pm in the Meadows Courtyard, 1810 Crickets Avenue. June 22….Sock Hop at the Holly Hop – Come for a short lesson at 7 p.m….followed by a Dance to the Hits of the Fabulous ‘50s. Come dressed in your ‘50s attire. Acencio from Absolute Dance with be the deejay. Admission is free. And of course, there will be delicious Holly Hop treats to cool you down. Holly Hop Ice Cream Shoppe, 3404- 34th; 7 - 10 p.m.
June 22, 23, 24, 25….Critterfest ’17 - Lubbock’s most popular annual animal event is back again this June. Nowhere else in town can you see bears, elephants, alligators, crocodiles, camels, a kangaroo, giant tortoises, big snakes, and tons of other cool animals as the Science Spectrum literally turns into a Zoo for four days. Awesome and amazing animal acts, as well as the extremely popular petting zoo, pony and camel rides, along with many of other animals on display continue to make this event a hit for the whole family! Two exciting shows will be featured at this year’s CritterFest. Rosaire’s Bears and Crocodile Encounters will headline the always popular animal entertainment. Rosaire’s Bears is an all new act never seen in Lubbock before featuring brown bears. This show will not only astound you with these animal’s intelligence, but teaches important lessons about conserving wildlife and wild habitats. Crocodile Encounters is an educational reptile show that will introduce you to live American alligators and Nile crocodiles in order to educate the public about conserving these often misunderstood animals. Your ticket to CritterFest not only includes viewing of all the amazing animals on display and getting up close and personal seating to all of the exciting shows, but even includes regular Museum admission. The Science Spectrum Museum is home to Lubbock’s only public Aquarium Exhibition, Texas Alive: the Brazos River Journey!, a 6000 square foot permanent exhibit with both fresh and saltwater fish and other native Texas animals. Tickets for CritterFest ‘17 can only be purchased at the door each day of the event! Box office opens at 10:00am daily. For more event information the public may call 806-745-2525, or visit www.sciencespectrum.org. Science Spectrum Museum, 2579 S. Loop 289: 10 a.m.- 6 p.m. daily. June 23….Pure Country: A Cactus Tribute to George Strait and Merle Haggard - Join us for a special night of REAL COUNTRY MUSIC as the Cactus celebrates the monster career hits of two of the biggest names to ever grace the stage: "King" George Strait and "Mighty" Merle Haggard. We'll serve up the greatest of these two greats in equal helpings...charting the careers of two of the most consistent hit-makers that country has ever known. We'll feature an amazing lineup of talented vocalists who will capture the essence of these music titans as we chronicle their respective careers through the past five decades. 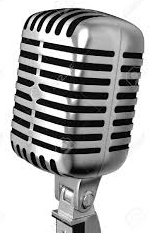 A partial sampling of songs you'll hear: "Amarillo By Morning", "Mama Tried", "The Chair", "Big City", "Fightin' Side of Me", "All My Exes Live In Texas" and so many more.Confirmed vocalists include: Danny Cadra, Jerry Brownlow, Mark Paden and Jeff Bailey. Tickets only $20 for reserved floor seats; $15 for standard balcony; limited number of box seats at $40 - which includes concession stand goodies. Box office open daily 3:00-5:30 p.m. or call (806) 762-3233 or order online at cactustheater.com. Cactus Theater, 1812 Buddy Holly Ave: 7:30 p.m.
June 23 - 24 (Repeats July 30-July 1)….Lubbock Moonlight Musicals Presents: “The Adventures of Tom Sawyer” - To begin the 12th summer season of Lubbock Moonlight Musicals, we are happy to announce our upcoming production of Mark Twain’s timeless tale, The Adventures of Tom Sawyer. Based on the Mark Twain novel, The Adventures of Tom Sawyer, centers around the escapades of orphan-teen, Tom, and his miscreant best-friend, Huckelberry Finn. Set on the banks of the Mississippi River during the end of the 1800s, The Adventures of Tom Sawyer exhibits a simpler life, the power of friendship, young love, and the merits of mischief. Join us for a musical adventure with “Tom Sawyer” at the Moonlight Musicals Amphitheatre this summer! A great date night or family outing, “Tom Sawyer” will be fun for all! Picnics and coolers welcome! TICKETS: Adult Premium - $31; Adult GA- $23; Student GA- $15; Child Premium (12 and under) - $18; Child GA (12 and under) - $10 (INCLUDING SERVICE CHARGE) Tickets at all Select-A-Seat locations and online. Phone 806-770-2000, or visit www.selectaseatlubbock.com. City of Lubbock Home/. 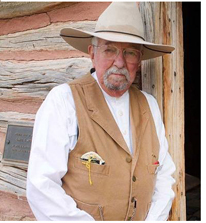 Moonlight Musicals Amphitheatre, 413 E. Broadway; Gates open at 7 p.m., and the performance begins at 8 p.m.
June 23 – 25….Texas' Last Frontier Heritage Celebration - Step back into the early life and times on Texas' far western frontier! Join in a variety of events throughout the weekend celebrating Cochran County's western frontier heritage. On Friday fire up your cookers for the Cochran County Historical Commission’s Brisket Cook-off with winners announced and prizes award on Saturday. 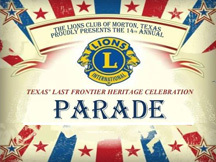 Saturday morning follow the crowds to a downtown parade in Morton featuring a kid’s "Decorate Your Bike" Contest and "Love My Ride" Car and Motorcycle Show, floats, antique tractors, motorcycles and ATVs, and horseback riders, followed by an exciting car burn-out contest. Then come to the county park to enjoy Buffalo Soldier and Native American history, a flintknapping/arrowhead making demonstration, the Richard Houston and Gerald Richards Band, young ladies' prairie tea, a fantastic car and motorcycle show, summer water sports, bingo and domino games, kids' chalk drawing contest, and a variety of food and craft vendors—among other festivities! On Sunday morning join in a community worship service in the park sponsored by the Cochran County Ministerial Alliance, followed by a delicious Sunday dinner. No overall admission fee. For more information visit (www.facebook.com/texaslastfrontier). Cochran County Park (1.2 miles east of TX Hwy. 214 on FM 1780). June 24….Connect Church Garage Sale - Lots and lots and lots of stuff to come rummage through! Someone else's trash is your treasure! All will be priced to sell. All proceeds go to bringing a pastor on full time! Come on out and join the fun! Connect Church, 130101 US HWY 87; 8 a.m.- 3 p.m.
June 24….Lubbock Downtown Farmers Market - Looking for best in local produce, handmade and artisan products? If the answer is "yes"...then visit the Downtown Farmers Market each Saturday at 19th and Buddy Holly Ave from 9 a.m. to 1 p.m. for a taste of downtown Lubbock - where you'll find the finest in local produce, meat, dairy, cheese, baked goods and arts. The full 2017 market season will be every Saturday from June 3rd to October 28th from 9 a.m. until vendors sell out. For additional information, visit lubbockdowntownfarmersmarket.com/. We look forward to seeing you every Saturday at the Lubbock Downtown Farmers Market at 19th Street & Buddy Holly Ave.
June 24….National Ranching Heritage Center presents: Ranch Host Saturday - Ranch Hosts dressed in period clothing will be available in the historic park to answer visitors' questions and share information about the structures. National Ranching Heritage Center, 3121- 4th St; 10 a.m. - 1 p.m.
June 24….The Life and Art of Wassily Kandinsky with Christian Conrad - Wassily Kandinsky (1866-1944): One of the most important art theorists of the past century, Wassily Kandinsky sought to develop a scientific system of how colors and forms effect human emotions. Famous for his text “Concerning the Spiritual in Art”, Kandinsky created the first non-objective paintings that rely solely on the composition’s formal aspects, such as lines and shapes. 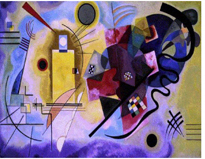 Join us as we examine Kandinsky’s life and art and begin to unravel the complicated world of non-representational art. Saturday Lectures at LHUCA is an informal conversation over the life and work of contemporary artists. It’s a stress-free opportunity to examine the art and ideas that underlie much of the modern art world. Attendees are encouraged to ask questions and join the conversation. This event is free to the public. Join us for coffee and donuts! The Louise Hopkins Underwood Center for the Arts, 511 Avenue K; 11:30 a.m. – 1 p.m.
June 24....The Roundtable presents: Joy Loper, Program Director for Neighborhood House "Upbring, working to bread the cycle of Child Abuse"- Our luncheons are held at Hillcrest Country Club 4011 N Boston Ave, Lubbock. North on University past State Living Facility to Newcomb, left for about 4 blocks and you will come to the entrance of the Hillcrest Country Club at Boston and Newcomb. Meeting format: People arrive about 11 a.m. to start registering, pay for lunch and some socializing. Food service starts at 11:15 followed by introductions and announcements at 11:30.The speaker will start about11:50 and be finished with the program and questions from the audience by 1 p.m. The public is invited. Lunch/attendance is fifteen dollars ($15) per person. Limited menu includes beverage and dessert. There are no membership fees or dues associated with attending the functions. Any extra monies that you would like to contribute will go towards the speakers lunch and towards our Honors College Scholarship fund at Tech. Our Saturday luncheons are a great way to (1) learn more about current global/US/Texas/Lubbock issues and events, (2) meet other people in area who may become lifetime friends (3) feel more at home in Lubbock. Most wear business or business-casual attire. No RSVP is necessary. Show up whenever your schedule allows, feel free to bring a guest(s) and email this invitation to anyone you think might be interested. For more information email Marie Evans at this address: mevans1398@aol.com. June 24….Summer Dance Series: Contra Dancing - The Office of International Affairs at Texas Tech presents the Summer Dance Series 2017 for a fun evening of Contra Dancing (English/Scottish/French folk dancing). There will be a live band and an instructor to teach the basic dance steps. This is the first in a series of three international dance events to be held this summer at the International Cultural Center. Enjoy light Refreshments/cash bar. Admission is free. June 24 – Contra Dancing, July 8 – Tango, July 22 – Irish Set Dancing. The International Cultural Center of Texas Tech University, 601 Indiana Ave; 7 p.m. – 9 p.m.
June 25….Sunday Concerts at The Park - Bring your blankets, lawn chairs and picnics to Wagner Park and listen to the Westwind Brass Band every Sunday evening at 8:00 p.m. Concerts will be held at 8:00 p.m. on June 25; July 2, 9 and 16. Enjoy these free concerts for all ages and experience music out under the West Texas sky in this neighborhood park. A special thank you to the Westwind Brass Band for their commitment to bringing music to the people of Lubbock every summer. Wagner Park is located at 26th Street and Flint Avenue. Question #1: What relative of the alligator is native to Central and South America? Question #2: What famous magician was born with the name Ehrich Weiss?